Salcombe Harbour and the open sea sailing along the nearby coast is the playground for ICC keelboat sailors. The club has a small keelboat fleet of squibs and solings Keelboats have a fixed keel and are the boats for you if you prefer to be in a boat that doesn’t capsize and is big enough to be safe for open sea sailing. Club members jointly own all the boats so you too can be a joint owner of a keelboat for just the cost of membership. Experienced new members only have to demonstrate their competence by passing a straightforward assessment of their skills and knowledge of the local area. A thorough briefing on all safety issues is always given to new members who don’t know the area before the assessment! Getting out to your boat is easy, Salcombe Harbour Authority run a Water Taxi service which runs frequently in season and costs . The club runs a free launch service on club afternoons and evenings . After qualifying you can choose how much sailing you want to do. If you just want to sail occasionally then the cost is £25 per person per half day. Low cost regular sailors option. The cheapest way to sail if you’re sailing every week is to buy a season ticket payable weekly by standing order at £20/week for 20 weeks or £10 / week spread over 40 weeks. The season ticket runs from April to October. You will need someone to crew with you but there is no extra to pay. The regular sailor option has to be the best value for money sailing anywhere! After all where else can you get access to unlimited sailing* for £10 per week!! Other benefits of being a club member? 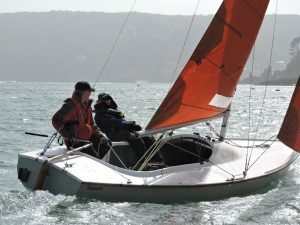 The obvious benefit is being with like minded people and sharing sailing experience and the joys of Salcombe harbour. Club get togethers are 2 Saturday afternoons and 2 Thursday evenings a month depending on the tide and weather. Communication is by email text and facebook.